There are few foods in the Mexican cuisine so versatile and that can be used in so many different combinations as the tortilla. In this occasion, and it is not a joke, we are going to prepare some delicious “flutes" – this is how they are known for its external similarity with the musical instrument. – The flutes are crispy tortillas that are rolled as taco and they can be filled with many ingredients like chicken , potato , chorizo with potato , etc. Within all this “world of flutes" the ones that have a stronger and more elaborated flavor, are these ones the beef flutes. Although many fresh ingredients are also put over them that help to balance and to soften the flavors. 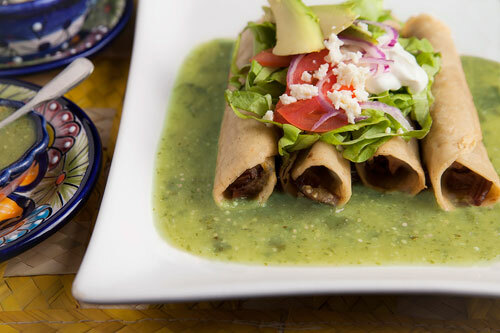 In Mexico the flautas are served as main course and normally any garnishes is put because the flautas are so abundant that there is no room on the plate for anything else. To make the flutes there are many steps to follow and some experience in the kitchen is required. It is important to choose an easy to shred beef cut once it is cooked. The most adequate cut is the skirt steak. Don’t use olive oil in this recipe because it is not good to fry tortillas. Prepare the flutes with your corn tortillas. The total preparation time is of 1 hour 20 minutes , however while the beef cooks you won’t work in the recipe. Make sure that the beef is always covered with water as it is going to consume. If scum accumulates on the surface remove it. Slice 1 tomato into half moons, then reserve. Cut 1/4 of a lettuce into strips, then set aside. Finely chop 1/2 onion (2.6 oz), then set aside. Verify that the skirt steak that was left cooking is well cooked and soft; if not cook it for a longer time. Heat on a griddle over medium heat 10 maize tortillas for about 30 seconds per each side, until they are soft. Remove from the griddle the tortillas and put on each one some of the skirt steak that was shredded. Roll all the tortillas as tacos and close them with some toothpicks; then set aside. Pour in a frying pan approximately 1 cup of vegetable oil, so you end up having about a 1/2’’ deep oil layer. Heat the frying pan oil over high heat. Put in the frying pan the skirt steak tacos that were prepared (just the ones that fit in) and fry them for about 2 minutes starting from the end where the tortilla was closed, until they are moderately fried; turn them regularly with some tongs. The tacos start to be fried from the side where the tortilla was closed to seal them and in this way the filling doesn’t spill. Transfer from the frying pan to some paper towels, with the tongs, the fried beef tacos so they dry and the fat excess is absorbed. Remove from the fried beef tacos the toothpicks, then reserve. Repeat the same procedure with the skirt steak tacos that were not fried, it won’t be necessary to add more vegetable oil in the frying pan. Cut 1 avocado into strips, then set aside. The avocado is cut at the end so it doesn’t oxidize nor it turns black. Transfer from the paper towels to a large plate the fried beef tacos that were prepared. 1/2 cup of Mexican Cream. The Lettuce strips that were cut. The Tomato half moons that were cut. The Avocado strips that were cut. Sprinkle 1/4 cup of crumbled Fresh Cheese. Preferably put the ingredients in the same order as given so the tacos come out beautiful. * Eat quick the flutes because they can soften. Recommendation: Put a delicious red salsa to your flutes so they will have more flavor. Did you like the Beef Flautas? Here is the Skirt Steak that you need to make the flautas. The beauty of this skirt steak is that it is 100% organic, it is soft, it has a lot of flavor and it will arrive fresh to your house. To cook the flautas many kitchen utensils are required... and with such a complete and elegant cookware set as the Cuisinart your problems are over at the moment of cooking. While the beef cooks enjoy a Mexican candy... enjoy a Mazapan. The flavor of these mazapnes is phenomenal, they are soft, and to complement the flavor they have small pieces of peanut.